Check Prices, Availability. Book online or call 541-386-3845 for reservations. The Oak Street Hotel & Vacation Homes is a year round hotel and vacation rental management office in the Columbia River Gorge. We maintain an inventory of nightly, weekly and monthly vacation homes throughout the year. Servicing Oregon and Washington, we have a home to fit your lifestyle. Many of our Hood River vacation rentals are located within walking distance of downtown Hood River and a short drive to water recreation on the Columbia River. Other vacation homes in White Salmon, Washington and in the Hood River Valley are close to hiking, mountain biking and snow activities. Enjoy a day of white water rafting in the summer or skiing at Mt. Hood Meadows in the winter. 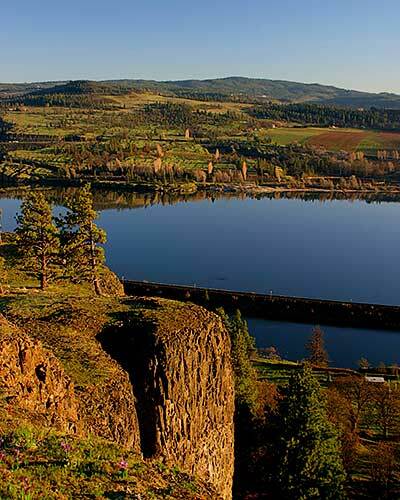 The Columbia Gorge is a perfect setting for a romantic getaway. Visit OakStreetHotel.com to make your reservation or visit our Vacation Home website to reserve a vacation home or condo. Bring your furry companion with you to the Gorge! Some owners allow a trained, well-behaved pet to vacation with you for an additional rate. Our staff is here to ensure you have a wonderful vacation in the Gorge. Ask us if you have a special request. All reservations are subject to Oregon Transient Lodging Tax or Washington sales tax, a guest service fee and a cleaning fee which varies on the size of the home. Check Availability. Book online or call for reservations.